The sharp deterioration of relations between Washington and Ankara in the last week is only one of two crises enveloping Turkey at the moment. The Turkish lira is in a free fall as investors sell it off over concerns about economic mismanagement and uncertainty caused by the strain between the United States and Turkey. No doubt there are a lot of people in Washington busy developing three, five, and 10-point plans to save the Turkish economy and the U.S.-Turkey relationship. They are wasting their time; there is nothing for the United States to do. Of course, the United States has an interest in a healthy Turkish economy, if only to prevent the meltdown of the lira from affecting other emerging markets’ currencies. That threat is somewhat diminished right now because investors are on vacation, but August will soon become September. To head off a deepening of their economic woes next month, the Turks have to want to help themselves, and it is not at all clear that’s the case—or that Erdogan’s political interests will let them. The president’s son-in-law, Berat Albayrak, who also happens to be Turkey’s minister of finance and treasury, has unveiled a plan that is fairly responsible. According to Bloomberg, Albayrak plans to pursue fiscal discipline, help companies most affected by the lira’s slide, and, contrary to rumors, the government will not seize foreign exchange deposits—good news for foreign investors. At the same, the minister stated that the volatility of the lira was unsupported by the underlying economic data, thus it is clear Turkey is under “attack by the biggest player of the global financial system.” He means the United States. No one should be surprised by the accusation that the United States is responsible for Turkey’s currency crisis. Since at least 2013, Erdogan has been telling Turks that when the day of reckoning comes for the Turkish economy, it will be someone else’s fault. If Turks are suffering, then it could not possibly be the responsibility of a government led by someone who believes high interest rates cause inflation (which is exactly backward), but rather the result of the nefarious machinations of the “interest lobby,” Zionists, and the always useful “foreign forces.” Because Erdogan has made the economy a nationalist issue, seeking help from the IMF is politically risky. Instead, all of the Turkish president’s incentives are to do exactly what he has been doing: hang tough, blame Washington, appeal to God, and encourage his constituents to exchange dollars and euros into lira. So why should anyone believe Albayrak when he announces how he is going to rescue the lira? On the relationship with the United States, Erdogan’s declaration that Washington is waging “economic war” on Turkey reflects just how toxic relations between the two countries have become over the last five years. In certain offices at the State Department, Pentagon, and among a dwindling number of foreign-policy analysts who want to give Ankara the benefit of the doubt, there is much anxiety about the end of the “strategic relationship” and the need to save it. But why? It should be clear by now that there is no strategic relationship. Turkey and the United States have different interests and priorities. The lists of grievances on both sides reflects that fact. The fallout is not a function of the unique personalities and worldviews of the American and Turkish presidents, but rather at a fundamental level is the result of a changing world in which Washington and Ankara no longer share a common threat. No doubt the White House poured gas on a fire with the announcement of tariffs as the lira was sliding—a gratuitous move that smacks of Trumpian chest-thumping in anger over pastor Andrew Brunson that only helps Erdogan’s narrative that everything is Washington’s fault. 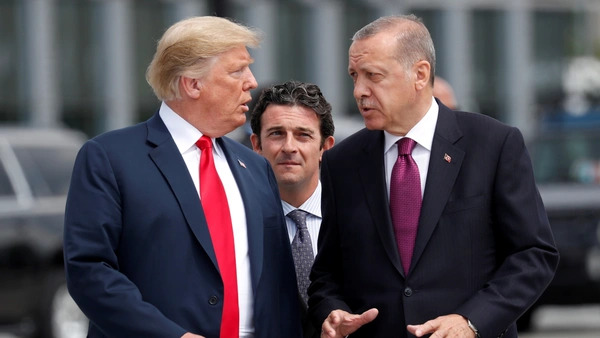 Still, the pressure that the Trump administration has brought to bear on Turkey is a welcome change from the passivity of the last two administrations, which preferred to overlook Turkey’s malign policies, either in an effort to try cajole Ankara to support the United States or because they did not want to risk a rift with a “strategic partner.” Not only did this approach not work, but it also sent the message to Ankara that it was so valuable an ally that there would be no consequences for its actions. Applying pressure on Ankara may not work either, but the stakes are pretty low. Turkey’s importance to Washington has been waning for some time. The Turkish government is ambivalent about the Atlantic alliance, has found common cause with extremist groups, and stirred up trouble in the Gulf, Jerusalem, and the Red Sea. Even the value of Incirlik has diminished as the threat of the Islamic State has receded. Besides, with Ankara developing ties to Moscow it seems unlikely that the base will be as useful in the coming great-power competition as it was during the Cold War. What else is there? Not much. For the longest time, the legacy of the Cold War and the NATO alliance have framed the discussion of Turkey in Washington and Europe. Perhaps the controversy over Pastor Brunson and the way the Turkish government has responded to the lira crisis will be a clarifying moment, highlighting what should be clear by now: Turkey is no longer an ally or partner.